At the American Clock & Watch Museum in Bristol, CT, one can join the Old Cranks Tour as volunteers wind hundreds of clocks in the museum. Something interesting happens on the first and third Friday of every month in New England. 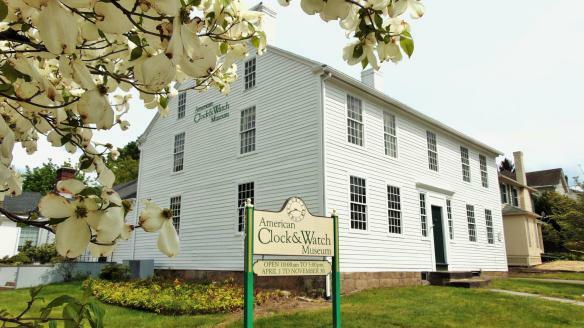 At the American Clock and Watch Museum in Bristol, Connecticut, visitors can join the Old Cranks tour. 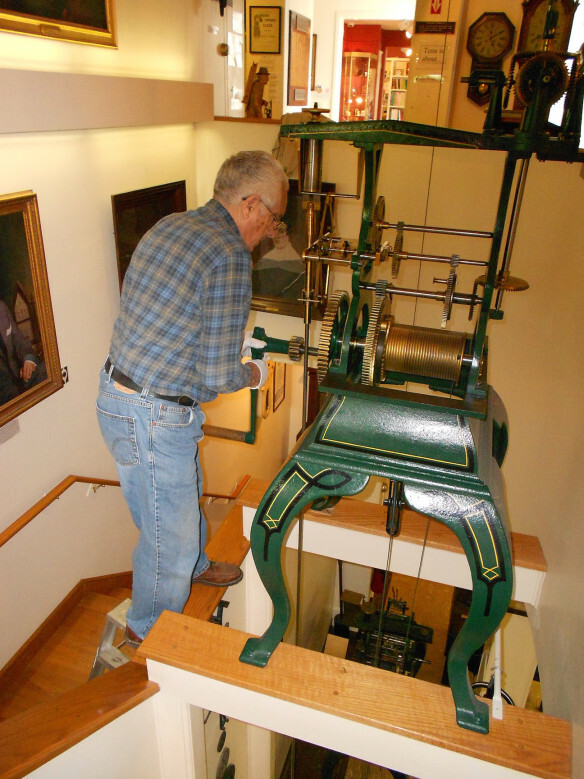 During this exceptional time frame, four long-time volunteers at the museum come in to wind the approximately 60 to 70 historic clocks — many needing different types of winding. It is a fascinating tour, as the volunteers work their way through all of the museum’s eight galleries. For the price of a regular admission ticket, visitors can not only watch these volunteers as they wind different kinds of timepieces, but also will be treated to wonderful stories about the clock and the history of American matchmaking in New England. 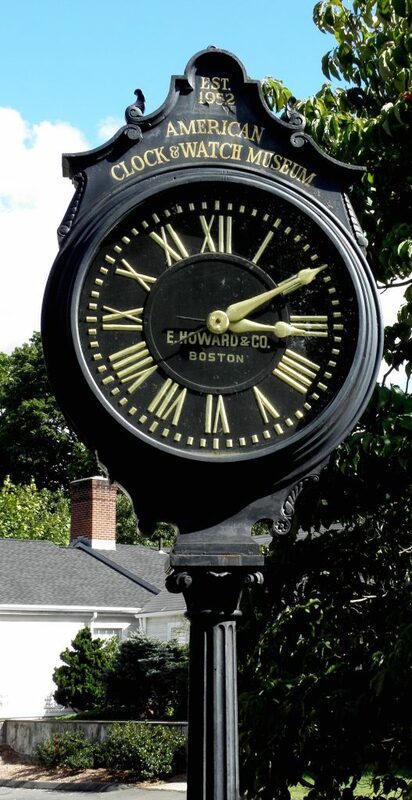 The American Clock & Watch Museum offers Old Cranks tours on the first and third Fridays of each month from 10 – 11 a.m.
Street clock by E.Howard & Co. outside the American Watch & Clock Museum in Bristol,Ct. In addition to the Old Cranks tour, the museum plays home to one of the largest displays of American clocks and watches in the world — with more than 5,500 pieces. Located in the historic “Federal Hill” district of Bristol, the museum is housed in an 1801 Federal-style home with a sundial garden. One very interesting aspect of the museum is one of its current exhibits: the world’s largest Kit-Cat clock. Apparently this world’s largest Kit-Cat Clock is on loan from the Kit-Cat Clock Company as part of the brand’s 85th anniversary celebration. With a swing of its tail and a roll of its eyes, these American-made clocks have been keeping time and making people smile since 1932. In honor of this event and exhibit, the museum is collecting cat food, toys, and monetary donations in support of the Friends of the Bristol Animal Shelter. If you are interested in this exhibit, you have to hurry- it will only be on display until the end of August. Clocks and American matchmaking history are the focus at the American Clock & Watch Museum. Fear not, though, because AC&WM also offers a host of intriguing vents. On Sunday August 27, for instance, it honest he third annual tor of Bristol’s historic Federal Hill area with talks about what life was like in Bristol during the first World War — a time when women supported the war effort and watches were made in America. The following month, on September 14, the museum sponsors a Wine,Women and Watches party that should have women ticking in. Thank you for the coverage of this wonderful quaint New England museum. They really have some fascinating pieces there. And I just was reminded I have to make a donation to these fine folks that keep the place ticking. Highly recommended.